Home EntertainmentHolidaysChristmas	Some Christmas Cheer…. I worked on my christmas tree garland and the other ladies made some super cute glitter pinecones. I have to say, I really love my little craft and it was a nice diversion to get creative for a bit. 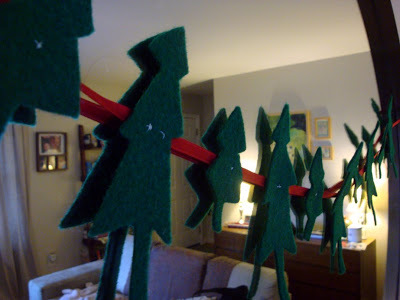 It was super easy and would be even easier if you used glue instead of sewing the trees to the ribbon. I wasn’t sure where I would display it, but I think my trees have found their home on the mirror in our living room. It makes me smile. Have you done any crafts this Christmas? Please! You were the craft-savviest there, our glitter pine cones had nothing on your awesome garland. I'm so glad you came and can't wait to do it again!